History: This enormous white marble tomb was built to hold the remains of Mausolus (Mausollos), a provincial king in the Persian Empire, and his wife, Artemisia . Greek architects Satyrus and Pythius designed the approximately 135-foot-high tomb, and four famous Grecian sculptors added an ornamental frieze (decorated band) around its exterior. 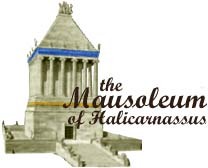 Word of the grandeur of the finished structure spread though the ancient world, and the word "mausoleum" came to represent any large tomb. The monument was damaged by an earthquake in the early 15th century and eventually disassembled. Only the foundation and some pieces remain. The British Museum in London has several of the mausoleum's sculptures.